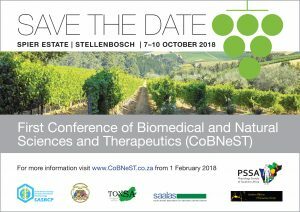 The First Conference of Biomedical and Natural Sciences and Therapeutics (CoBNeST) will be held in Stellenbosch from 7 – 10 October 2018. We are pleased to invite registered SANS members to apply for travel awards to support attendance at this inaugural conference. Two travel grants available to postgrad/postdoc SANS members outside of the South African borders and within Southern Africa, to the value of R10 000 to cover registration cost (R2, 500) and contribution to accommodation/travel expenses. Two travel grants available to postgrad/postdoc SANS members outside of the Western Cape and within South Africa, to the value of R5 000 to cover registration cost (R2, 500) and contribution to accommodation/travel expenses. Two travel grants available to postgrad/postdoc SANS members within the Western Cape of South Africa, the value of R2 500 to cover registration costs. Please see the attached flyer for further conference and award details. We look forward to seeing old and new SANS members at this beautiful venue to talk neuroscience and promote transdisciplinary research!